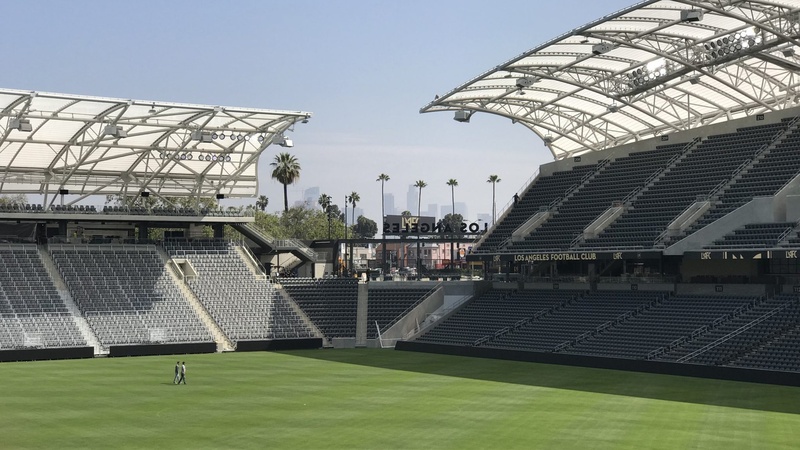 The Banc of California Stadium opens to the public this weekend with LA Football Club’s first home game. The stadium holds 22,000 seats. But the owners insist it will feel intimate, with shops, restaurants and an events center. The new stadium is in Exposition Park, right next to the LA Memorial Coliseum. It is also adjacent to the California African American Museum, the California Science Center, the Natural History Museum of Los Angeles County, and the future Lucas Museum of Narrative Art -- and very importantly it is close to the Metro Expo Line. It sits on the site of the former LA Memorial Sports Arena, designed by Welton Becket, opened in 1959 by Vice President Richard Nixon, and beloved by musicians, including Bruce Springsteen. But where the arena was closed and dark and heavy and inward-looking, this stadium is light and open and outward-focused. It’s the first open-air stadium to be built in the city since Dodger Stadium was completed in 1962. 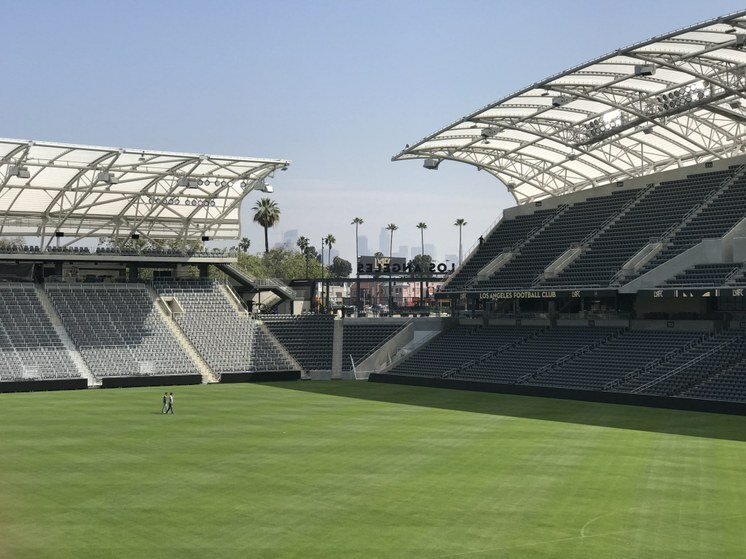 The design team at Gensler has managed to achieve a “soccer-specific” stadium that feels intimate, thanks to its relatively small number of the seats (22,000 compared to 90,888 at the Rose Bowl) and the steep 34-degree rake of those seats (the steepest in MLS). The seats at the pitch level are just 12 feet from the touchline. But even as you feel very close to the pitch and the players, your eye will also be drawn to distant views. The building has an EFTE (translucent plastic) canopy over the seating areas, but it is open at the corners so you can see framed views of the downtown skyline or the Coliseum. It is open to the sky, which is spectacular. Another soccer-specific feature is the first safe standing rail seats in North America. The supporter section at the north end of the stadium will allow more than three thousand energized fans to stand and cheer on their team. One of the most fascinating things about the process of this design is that Gensler and the clients were designing a home for a team that didn’t yet exist -- no players, no coach, no manager, no logo, no team colors. Even the name -- Los Angeles Football Club -- was initially a placeholder. And yet right from the start the owners cultivated a fan base of support clubs who were committed to the idea of the team. And these support clubs became part of the design process. Members of these clubs went to Gensler’s architecture office and offered feedback. As the design unfolded they put on VR headsets to feel like they were in the stadium and offer more feedback. They also used VR to sell the stadium and the team to investors and to prospective players. This project is a tour de force of marketing and building brand identity from scratch. The stadium design was shaped a lot by the ownership team (Peter Guber, also Will Ferrell, Mia Hamm and Magic Johnson), several of whom have a Hollywood background and really understood and wanted, says the architect, a “processional” approach to the conception of the building. This extends to the food vendors, who were selected locally for “authenticity” and quality -- duck fat fries from Beer Belly; barbacoa tacos and chips from Chicas Tacos; kalbi pork sausage and spicy chicken sausage from Seoul Sausage; brisket sandwich and mac and cheese from Bludso’s Bar & Que, and more. But there is no disappearing into a dark tunnel of concessions; vendors are situated in locations on the terraces from where fans can still eyeball the game and enjoy the views. The Banc of California Stadium holds 22,000 seats, but owners say it will offer an intimate experience for fans. Photo credit: Frances Anderton.